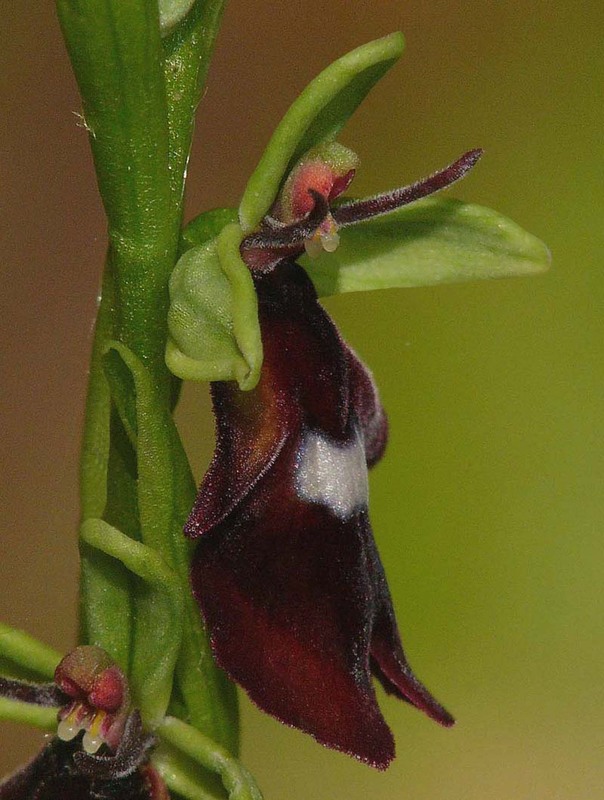 O. insectifera was first described from Oland, Sweden in 1753 and is a familiar Ophrys to most botanists who may refer to it by its common name of Fly Orchid. It is notable as being the most northerly species of Ophrys in Europe and may be found, albeit rarely in Scandinavia and central Russia. It is however, primarily a mid European orchid, being found in suitable habitat throughout central Europe as far south as Spain and Greece. It can be abundant in its favoured alkaline locations, where although it will tolerate a position in full sun, very much prefers the semi shade of hedge banks and light woodland. It is a distinctive orchid and in Britain is not easily confused with other species, except where it occurs in the extremely rare variant form luteomarginata which possess a yellow rather than brown lower margin to the lip. Photos 11, 12 and 13 depict a further rare variation from Hampshire, UK in which a tiny colony appears as either all or predominantly yellow. O. insectifera is a ready hybridizer and in Southern England, crosses with O. apifera have occasionally been recorded . The position in continental Europe is more complex and hybridization with many different taxons are known to occur with some frequency. In Spain and Southern France there can also be problems with identification due to the presence of two closely related species, O. subinsectifera and O. aymoninii. O. insectifera will grow in a number of differing conditions and on contrasting soil types. It can thrive at relatively high altitudes alongside montane specialists such as O. spitzelli, but perhaps its strangest site is in North Wales, where it happily grows on the raised bog rush tussocks of a lowland acidic fen with D. incarnata for company. The pictures date from early May in Southern France and late May in Britain.